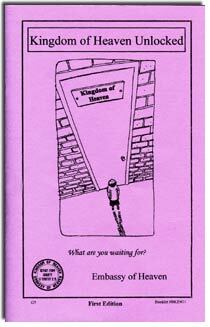 Kingdom of Heaven Unlocked provides scriptural support that the Kingdom of Heaven is God's Government on earth. Jesus succeeded in establishing a rival Government to the world and seeded it with His own life. The focus is around the constitutional convention which was held by our Founding Fathers during the "Last Supper." Evidence is provided which shows that we are citizens in His Government which frees us from the world.